Here is a round up of the Best Black Friday Microsoft Surface Deals along with the Cyber Monday Sales available this year! You can check out the full list of Black Friday Ads to see all the deals available at each individual store. You can also check the Black Friday Lightning Deals Page on Amazon for HOT Deals all during the Holiday Shopping Season! Amazon has the Microsoft Surface 32GB Tablet for just $459 right now. This will be on sale for $199.99 at Best Buy this year making for an awesome deal! You can check the Price on the In Stock Microsoft Surface Here. Amazon Prices change frequently and I expect them to match the Best Buy price at some point. You can find the 64GB Microsoft Surface In Stock for just $519 right now on Amazon! You can also Enter the Microsoft retail store sweepstakes for your chance to win the weekly sweepstakes prize, a Microsoft 32 GB Surface RT! 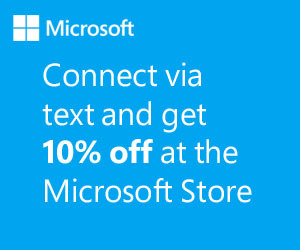 You will also receive a 10% off Microsoft retail store offer code and other incredible holiday deals when you register! You can also Text MSPFS in to 30364 for a chance to win a Surface tablet from Microsoft! Good Luck! Remember to opt in once you receive the text!